Though the ragtag group of misfits known as the Black Star Renegades won a decisive battle by destroying Ga Halle�s War Hammer, the war is far from over. In response to losing the crown jewel of its fleet, the evil Praxis empire has vengefully reinforced its tyranny across the galaxy--but its rule won't be had so easily. 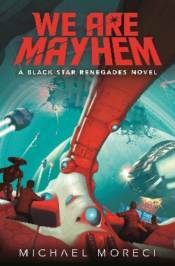 Led by hotshot pilot Kira Sen, a growing rebel force stands in the way of Praxis�s might. Not only do they possess the will to fight for galactic freedom, they also possess the ultimate ace in the hole: The mythical Rokura, the most powerful weapon ever known. Too bad Cade Sura hasn�t figured out to use it. As Kira wages an increasingly bloody war against Praxis, Cade is left with only once choice: With Ga Halle scouring every star system for the coveted weapon, Cade embarks on a dangerous mission into uncharted space to discover the Rokura�s origins. Only then can he learn how it can be wielded. Because if he doesn�t, all hope for the galaxy might be lost.